In doing what I do, I'm on construction sites all over the Chicagoland area. As with any big city, one of the things you ask when you have to go to these places is, "Where do I park?" If you have to compete for a spot with the regulars, you can waste a ton of time and risk getting a ticket or towed, just to do your job. So, a client who arranges for parking is wonderful. Thanks to my job, I look at structures differently. This is the junction of Lake Shore Drive and Illinois Street, a couple blocks from Navy Pier. There's an off ramp to the left and Lake Shore Drive is to the right. It was rebuilt, in this area, some years ago and both don't show signs of wear, even though this is right along the lake. We talk about our infrastructure and how so many bridges and roads need to be replaced or resurfaced. 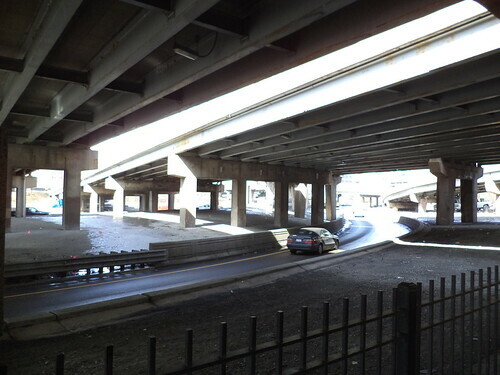 All the expressways in Chicago have been rebuilt at least once since I've lived here. The very messy "circle" interchange just west of downtown Chicago is finally undergoing a redesign. 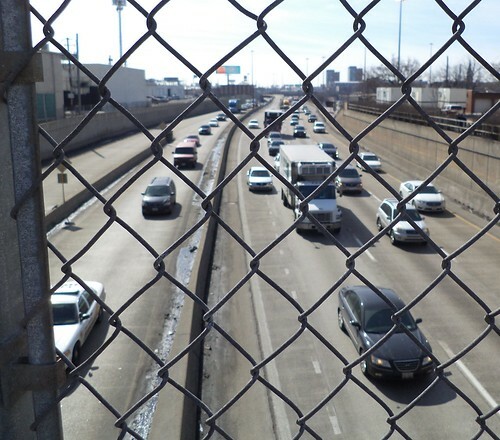 The "circle" takes it's name from how the Dan Ryan, Eisenhower and Kennedy expressways meet. Directions are marked but it's a maddening interchange and badly in need of a redesign. It's also in a space confined area. I think there's a beauty in the stark design of our roads and bridges. Even traffic can have a visual appeal. I see a lot of this and if you commute, it is perhaps your vision as well. I find myself, when I'm stuck in traffic, looking about to see the construction, see the interesting details of the roadway on which I find myself. Life is a journey. 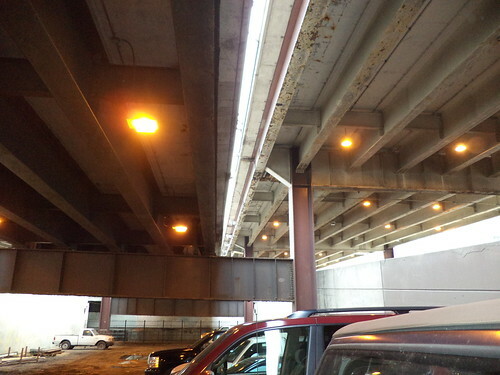 If I'm going to be stuck in traffic, or in road destruction, as I like to call it, or parking under an expressway, I'm going to find the interesting bits about it.